Reviewers have called it "powerful" and "brilliant." Newly released for its 25th anniversary edition, Jack Engelhard's novel Indecent Proposal has found its place alongside such classics as Fitzgerald's The Great Gatsby and Tolstoy's Anna Karenina. 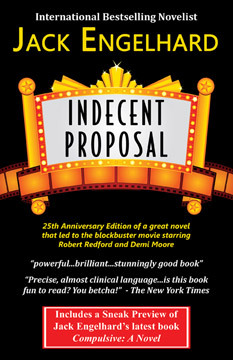 Indecent Proposal remains one of the most widely-read and discussed novels around the world, due to the strong writing and riches that include a moral dilemma for the ages. The novel was translated into more than 22 languages, and Hollywood produced a mega-hit movie based on this book starring Robert Redford and Demi Moore. The novel stands as a remarkable achievement from a great and legendary novelist. Though Hollywood only skimmed the surface of Engelhard's masterpiece, the theme is eternal, even biblical - temptation! The plot has riveted the world's readers and moviegoers. A destitute couple tries their luck in an Atlantic City casino. The wife, Joan, is utterly gorgeous. She attracts the attention of an oil rich sultan who can buy anything he sets his eyes on. Can he buy people? Can he "buy" Joan? What would you do for a million dollars? Mention the title, author and/or ISBN 978-1-77143-087-6.